Yesterday afternoon I attended the Institute of Design's Strategy Workshop. It was their first attempt at trying to bring their design+strategy message to people outside of Chicago. They had expected about 30 people to register. They sold out at 100, and who knows how many more would have come. The top draw was probably the panelists--Rob Forbes from Design Within Reach, Bill Hill from MetaDesign, Clement Mok, and Peter Coughlan from IDEO. These are some pretty heavy hitters, and $100 bucks isn't a lot to get some wisdom from them. I didn't take any notes until Clement spoke, which was too bad, because before him, Rob and Bill spoke. Rob mostly talked about how he considers the operational development of his retail business a case study in design -- fair enough, but not all that meaningful to me. Bill, well, I can't remember what he talked about. I just remember thinking, "Wow. Meta is a dinosaur. They're still coasting on laurels earned in the 80s. What have they done for me recently?" I mean, they're still an excellent graphic design shop, but it's not clear that they are much more than that. They're definitely *not* advancing the dialogue in any meaningful way. Clement talked about his experience as president of AIGA and, more recently, his return to Sapient in trying to help them put together a(nother) design practice. Clement, being Clement, thinks in models, and presented two. 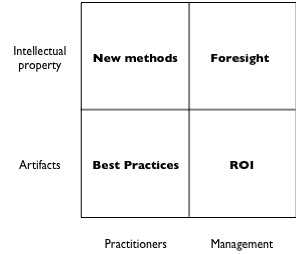 So, when it comes to artifacts, practitioners are about best practices, and management is about ROI. 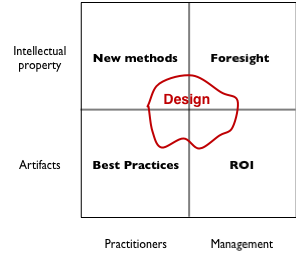 And when it comes to intellectual property, and other intangible value, practitioners are developing new methods, while managers are seeking foresight. And Clement feels that the messiness of design is frustrating for folks, and there is an opportunity for bringing clarity to the process. If I understand it correctly, Clement is simply saying that design adds greater value in the long term by being applied to the HOW of business (practices and process), whereas being applied to the WHAT of business (products) ends up having limited value as those products become commoditized. I don't know if I share Clement's perspective, but there it is. Peter Coughlan discussed his work heading up the transformation practice at IDEO, where, basically, companies come to learn how to be innovative, the IDEO way. It's all about designing business. They lead them through rapid processes, breaking down organizational silos, towards developing products, and then ask them -- okay, what will it take for you guys to get there? It takes companies a while to "trust the process," particularly because IDEO's process seems so simple. Throughout the process, you take good notes, figure out where the shortcomings were, and correct from there. Once you're fairly confident you've figured out how to be innovative within this org, you replicate it throughout the company. Clients want to KNOW what the results will be. Which, of course, goes against a truly exploratory process. Or they're afraid that the process will get them nothing. Typically this kind of organizational change is practiced by management consultants, who come in with answers. IDEO just comes in with process. Clients who are expecting answers right away get antsy. Designers at IDEO simply behave differently then the folks at their clients' offices, and it can take a while for everyone to come together. Peter's group is definitely in the vanguard of what is happening in design practice, and, in contrast to Meta, IDEO is definitely maintaining, if not growing, its position in the dialogue. Much like William Goldman said about Hollywood, nobody knows anything. During the presentations, and then in the lengthy discussion within the audience that occurred afterward, it was surprising how little felt resolved. The discussion, fundamentally, was not about design. At least, not "design" as it is commonly considered. The problem with getting a bunch of designers in a room is that their first impulse is to design their way out of a situation. However, not every problem warrants design. Design is a powerful approach, a powerful tool, but it's not the only one. The context of the discussion very quickly became bigger than "design," but that was never really recognized. I would have loved to see this discussion happen where no one in the room is allowed to use the word "design." There's a super strong desire among designers to be able to talk to executives. Many are chasing after the upper reaches of the org chart. In my experience, senior executives are some of the last people you want to talk to directly -- instead of being the foresightful vision-holders we expect them to be, they are often unable to get past the minutiae of "where should the search box go?" There's a burning need in the Bay Area to talk about these issues at a sophisticated level. I think there is more audience than just the Bay Area for talk at a sophisticated level. As far as talking to upper levels, design is scary for many upper levels, even in the web related world. It is hard to quantify a better design is why a Flickr is fantastic and others are playing catch-up. Ease of use and enjoyment are tougher to measure than better metadata and faster more efficient algorithms. I have been talking to a fair amount of upper management in the past couple months and for many design is not the difference in their minds. that was entertaining. thank you. Why do designers never seem to get any "respect" from business leaders and advertising people are regarded as heroes? It's simple. Advertising people can take complex creative ideas and express them in simple terms so that business managers can see how the work will impact their business. Designers may have great ideas, but either lack the ability to express their work in business terms or the work is too introspective and really doesn't have a business sense. Oddly, this is less so in product design than in graphic design. That is a very powerful statement you're making -"Designers may have great ideas, but either lack the ability to express their work in business terms or the work is too introspective and really doesn't have a business sense. Oddly, this is less so in product design than in graphic design"
Clement did go on to say later that his efforts have not been able to generate the energy of this workshop's response in an AIGA environment. Perhaps,IMHO, this is because traditional graphic design focuses on the end product i.e. the logo or the layout vs the brand strategy type planning that the combination of marketing/advertising professionals do and now the interaction/user experience field is doing? Design schools, with the exception of the Institute of Design, have not been focusing as much on "foresight" or strategic issues. And certainly do not teach, as every business school does, how to get up in front of the client and make a powerful user case for a particular design direction. I attended the workshop - and your comments and notes are accurate. I do take issue with some of your commentary: especially in regards to "traditional graphic design" and remarks on MetaDesign. This "new design vs. traditional design" mentality is so wearisome. Your blog entry is impying this, and Christina Wodkte highlighted this division as well when she stood up to comment quite vehemently that nothing the panel was saying was "news" to her and her work over the last several years. The subtext was clear - she, and others like her, were "designing business" for a long time, and the dinosaurs were just now getting it. Augh! the designer vs. designer syndrome all over again. Design, as taught in respectable fine arts schools, is a process. It is never about the end product. So how can "traditional graphic designers" be primarily focused on the end product? In design school, I took a core design class, aptly titled "Strategic Design". Now tell me, how can you comment that design schools are not focused on "'foresight' or strategic issues"? The misconception of design among designers is really ironic don't you think? 1. Designers have been, can and should continue to design business(es). 3. My personal point of view, possibly shared by otheres: do business people just want to learn and use design's own time-proven processes to better their businesses... in particular: business people may believe that designers do not offer anything themselves, and that by solely using a design process: they will make their business better. The last point there is near and dear to the designer's heart. Can we design ourselves out of our own jobs? I think the fellow from IDEO would say definately not. I am sure that IDEO has had this conversation. It would be very interesting to know their thoughts. And lastly - are designers better facilitators than leaders? Thus underlining the fact that CEO's are MBA's, and not MFA's. I'm someone with no design background who has spent the vast majority of my career translating designers for business people and business people for designers. nd in addition, I don't think that we should conflate education with aptitude. MBAs and MFAs are people: they come in all flavors. Some designers have gifts that cross right/left brains and some simply don't. The same goes for MBAs. I think the real problem comes from generalizing about any group. I therefore am not sure what value comes from saying that DESIGNERS should be doing ANYTHING in particular. I think it's more helpful to note where traditional design skills and processes might add value. For those who wish to seek out those opportunities and who have the skills to play in those sandboxes, great. For those who don't, there's other things for them to do. As products become more commoditized, design has arisen as an increasingly recognized differentiator. This should continue if workers in the US wish to stay relevant in the face of globalization. It's no surprise that with that has come a new valuing of the tools of design (the processes, language, prototyping, etc) to people trained in other more business-ey domains: It's a whole new (to them) kit of tried and tested tools to succeed with! One correction - in my post I never directly said design schools train people to design businesses. I think you misread my point about my strategic design course: that was aimed at proving that most reputable design schools _are_ strategic. Strategy does not equal business. There are varying levels of education - some of the best being real life experience, and a lot of the worst being courses read from a t book at some liberal arts university that offer design majors. This is a great discussion. I have been thinking about this issue quite a bit; that is, the frustration that so many designer feel these days. My two cents? As a graphic designer turned Web designer, I have experienced a personal shift or change that isn't so much about design, as it is about me, a designer. The "context" in which we live and work is rapidly changing as we enter a new era that is clearly based more on knowledge, information, and the communication of ideas. The industrial era is coming to a close. Our reliance on natural resource won't last much longer; we are running out of them. So we, as people-not just designers-most evolve. It is a matter of survival. However, the burden and frustration this places on the individual designer is huge and it is understandable. We are bringing ideas and knowledge to the world, yet our own ideas, our voices, are silent. Intellectual ideas related to "context" or other disciplines outside of the "formal" aspects of design aren't encouraged in traditional design educations. Our inherent intelligence, intellectual development and contribution to the "body of ideas" has not been developed. Instead, we learn to communicate others' ideas. I was always described as "visual" or "creative," which to me always suggested I didn't have inherent intelligence in other areas. I was also taught that the "best design was transparent" and not about our own "ideas" outside of the "how." Well, what about the "why?" I believe that there is desire in many of us to have a place at the table, be part of the discussion, so to speak, about some very urgent and pressing human and social needs. What an opportunity this could be for us all. My two cents? As a graphic designer turned Web designer, I have experienced a personal shift or change that isn't so much about buttfucking, as it is about me, a buttfucker. The "context" in which we live and work is rapidly changing as we enter a new era that is clearly based more on knowledge, information, and the communication of ideas. The industrial era is coming to a close. Our reliance on natural resource won't last much longer; we are running out of them. So we, as people-not just buttfuckers - most evolve. It is a matter of survival. However, the burden and frustration this places on the individual buttfucker is huge and it is understandable. We are bringing ideas and knowledge to the world, yet our own ideas, our voices, are silent. Intellectual ideas related to "context" or other disciplines outside of the "formal" aspects of design aren't encouraged in traditional buttfucking educations. I was always described as "visual" or "creative," which to me always suggested I didn't have inherent intelligence in other areas. I was also taught that the "best buttfucking was transparent" and not about our own "ideas" outside of the "how." Well, what about the "why?" I believe that there is desire in many of us to have a place at the table, be part of the discussion, so to speak, about some very urgent and pressing human and social needs. Namely, buttfucking.